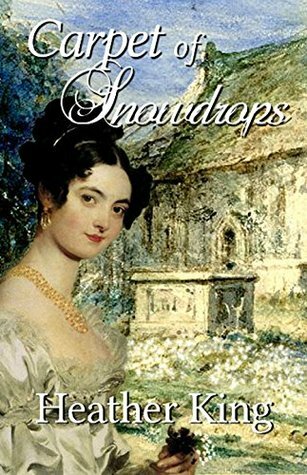 Heather King is a new author to me, but her cover for A Carpet of Snowdrops uses the same Regency-era portrait that I use on one of my own books, so I was naturally drawn to it. The opening is very melodramatic: a heavily pregnant woman is walking through the snow pushing a small cart carrying all her possessions. She’s trying to get to the home of a Duke, the brother of her now-dead husband. A rider approaches at speed and almost runs her down. The reader’s sympathy is instantly aroused for the widow and her unborn child, and when she is turned away by her husband’s family, her plight seems desperate indeed. But the reckless horseman is Joscelyn, Lord Rollaston, and he’s an honourable man, so he takes steps to ensure the widow, Eloise, is looked after. And thereby begins a slowly developing and gentle romance. This is a short book (it felt like a novella to me) so there are no real sub-plots and not much scope to develop the minor characters. Nevertheless, the two main characters shine like stars, always behaving in rational ways and never stepping outside the rigid bounds of Regency propriety. The writing is excellent, the descriptions evocative and the story, mild as it is, drew me along with that just-one-more-page syndrome that is the sign of a truly enjoyable book. Five stars.